Birthday Cake Matzoh is here to cheer everyone up on one of the less favoured Jewish holidays. (My sister and I eat pasta multiple times a week so it is quite the adjustment for us). It is the perfect DIY project to bring as a gift to your seder. Bring a small pot filled halfway water to a boil. Set a heat proof bowl on top of the pot. Add the chocolate and stir until it is completely melted. While the chocolate is still hot, spread evenly onto the matzoh. 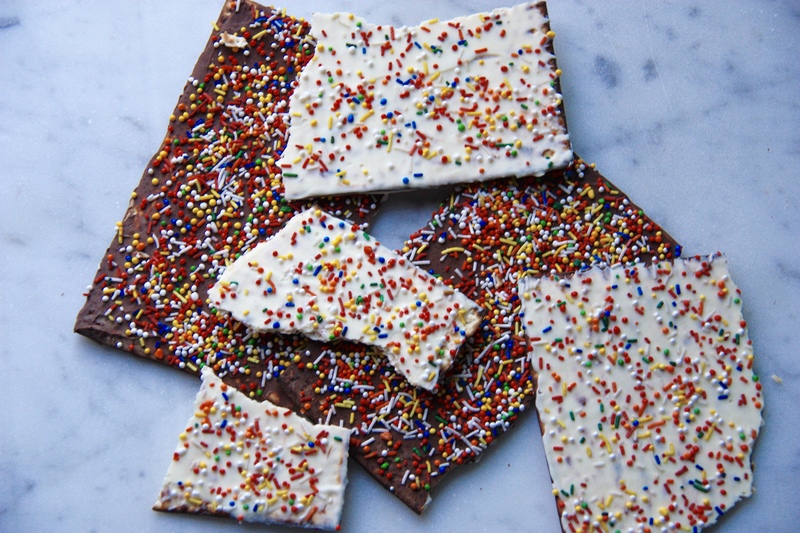 Top with sprinkles. Leave to cool on a tray for a half hour. Serve and enjoy! They can be stored in plastic bags or layered between parchment in a box. To make this dessert dairy-free, simply purchase dairy-free chocolate chips and add 1/4 teaspoon vanilla paste.